As I was reminded frequently on a recent trip to Majorca, there are times when we cyclists exhibit the kind of behaviour which, for a committed people watcher, could rival a Parisian boulevard. At the Monnaber tunnel at the top of the climb of Puig Major is a small car park and viewing area. It’s the natural spot for about 99% of all passing cyclists to rest the legs and admire the view, before pushing on. 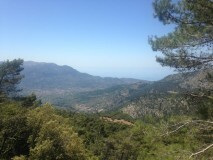 At 854 metres this is the highest climb on the island, and if conditions are anything like those I found (32C, humid, and still) it’s a bold move to push on and pass up the chance of a break. As I pulled to a halt and perched myself on the wall overlooking the town of Soller a few hundred metres below, there was already a gaggle of around 20 cyclists mopping brows and comparing notes – the usual assortment of Spaniards, Germans, and Brits. As I took it all in, a skinny and tanned lad approached up the climb on a smart matt black Canyon bike, with a matt black helmet, and decked out in head to toe Rapha kit – pink with a black stripe, black with a pink stripe, and smart looking climber’s shoes. Don’t get the wrong idea; I’ve got nothing at all against Rapha kit – it’s smart looking stuff, and this lad was clearly no mug on a bike – but then he went and spoiled it. He pulled up, leant his bike, removed his helmet, and whipped out a Rapha cap from his jersey pocket (black with a pink stripe). He then spent around 3 minutes posing majestically and looking every bit the biking hero, before tucking the cap back into his jersey, putting his helmet back on, and heading off down the road. Either way, it was all a bit comical. 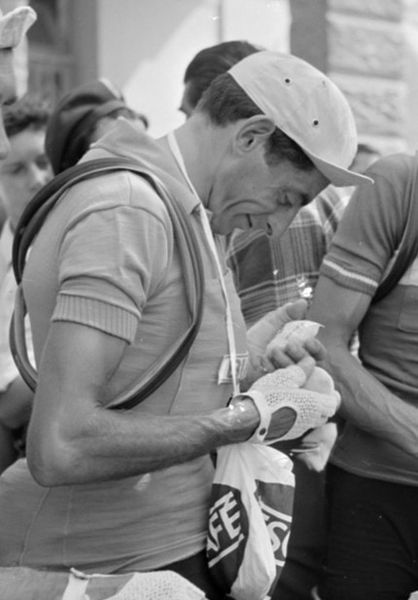 The humble cycling cap (or casquette) is a fine piece of kit when utilised properly, and as an antidote to the terminally un-stylish but unfortunately very necessary helmet (which is liable to make even the most stylish among us resemble the dreaded mushroom head). You can pop a casquette on pre or post-ride to keep the chills off, in the café, or tucked snugly beneath the helmet to protect the head from rain, sweat, chills, or a combination of all three. The only problem with the casquette is, in fact, the helmet. Look at most pictures of pro-cyclists prior to the 1990’s, and if they are wearing something on their head it is a cotton cap; whether pulled down tight, peak upturned, or even backwards, this is always a good look. What cyclist wouldn’t, deep down, like to head out for every ride looking like Eddy Merckx, Roger De Vlaeminck, Tommy Simpson or Fausto Coppi. But now, many of us wear helmets most of the time, and so to wear a casquette requires a little bit of imagination and creativity. Unfortunately, the I’ve-spent-good-money-on-this-so-I’m-damn-well-gonna-wear-it method demonstrated by my friend on the Puig Major is, for my money, trying a bit too hard. That was one climb I didn’t do on my recent visit. I’d have thought the one to pose on would be Sa Calobra, but no decent posing area? Puig Major was fairly pleasant, up from Sa Calobra through the Gorge Blau and some picturesque and turquoise blue lakes. This fella was heading down the road towards Sa Calobra, so perhaps he was reserving his best preening for when he got there. How’d you find Sa Calobra? Good fun eh? If a little busy! Wasn’t too bad. Loved the descent, always faster that I should know better. I had ordered a large cog for my hire bike (32t), made the ascent fun, despite the heat. I also had my camera dangling so I could take photos on the move. Sensationally scenic climb though and not too steep with the hardest bit at just 11%! Did his cleats make this sound when he walked: douche, douche, douche, douche? LOL! I’d have chuckled at him. Or asked him to move out of the way so I could take a picture! That would have been priceless! Haha, they made a sound very similar to that! His saving grace was that he looked like he could probably ride his perfectly manicured bike VERY quickly, so perhaps he earned the right? I have to assume that he did not want to be caught out with helmet hair… by a gaggle of helmet haired, sweaty swines! I thought I recognized you…you seemed to be enjoying the attention! Maybe that’s it, perhaps somewhere he’s written a witty and succinct blog post about all those terrible helmet haired cyclists he keeps spotting, who can even be bothered to carry a cotton peaked cap on their ride!